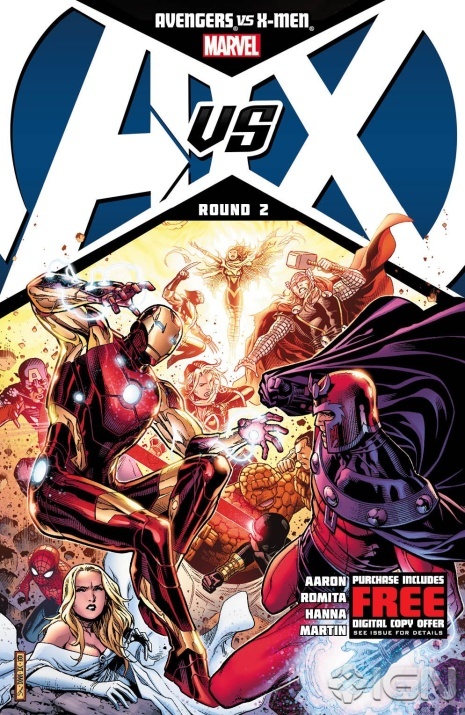 Last week, Avengers vs. X-Men issue #2 was released. Eager to see what is going on between two of my favorite teams, I was happy to get a hold of the latest issue. I noticed in the first few panels that both teams seemed a little worried about the fight to come. Cyclops was understandably upset that Captain America came to the island prepared to fight with over two dozen Avengers. Captain America knew that he did what he had to do by going to the island prepared for a fight. The fight begins and we finally see the X-Men and Avengers start exchanging punches. One of the most interesting parts to me was the exchange between Pietro (aka Quicksliver) and someone standing behind him. To keep from spoiling anything, I’ll just say that it left me a little confused on where this person stands in the battle between the teams. In the end, it looks like the tides have changed for both teams. The messiah of the mutant race appears to have a mind of her own and she’s using it. As we see Thor’s team in deep space readying to face the Phoenix head on, we are left wondering the inevitable…what’s next? Posted a critique of a comic book script on the Comics Experience Creators’ Workshop. This is an online forum for professional and amateur comic writers and artists to discuss their work in progress. Talked with friend and cartoonist Len Peralta about co-teaching a comics class for kids over the summer. We discussed content, and he also talked with me about an upcoming project that he’s developing. A comic series that I edit, Secret Service, had an issue due to the printer. I had to make sure all the art was completed, all the ad materials in order, pagination determined, covers signed off on, design elements in place, and so on. The schedule was tight and the fact that I was away from my usual home workspace complicated matters, but we managed to get it done. Received and looked over some art for another comic I edit, Supercrooks . The third issue will go on sale this week. I finished this graphic novel and thought, “I didn’t like it.” And then ten minutes later I went over the story, the main character, the setting, and I changed my mind. The art is spare, but expressive of the Wild West setting. Chester is a teen boy who seems to invite his bad luck to kick him in the face on a regular basis. The railroad is coming through, but there’s one town the workers won’t touch- Whale. It has a curse. Chester is hired to burn the place down. But when he gets there, he realizes it’s not abandoned, but there certainly is a curse. It’s not a pleasant tale: it’s gruesome and lonely. That’s why I initially didn’t like it. But Chester Kate has integrity, and that’s rare and special. This is an upper YA to adult book due to disturbing dead body shots, violence, and swearing. 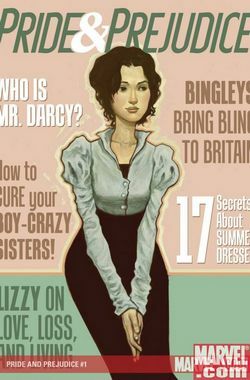 New to comic book corner, having not picked up a comic book or graphic novel for at least a decade, I this week discovered something tempting in Marvel’s archives: Pride and Prejudice the graphic novel. Adapted by Nancy Butler, with illustrations by Hugo Petrus, this was a surprisingly enjoyable adaptation. A lifelong Austen fan, I was a tad wary when I encountered this on a friends coffee table, but I found myself enjoying the artist’s interpretations of my favorite characters. Butler’s choice of dialogue and the manner in which she condensed the story line proved much more faithful to the text than I had anticipated. Several lines of dialogue that are generally considered essential to any adaptation were preserved, and the general tone of the story was in tact. Much more than can be said of the 1940 movie version starring Laurence Olivier. I am thrilled to discover this is merely one of a series of graphic interpretations of classic novels. How I missed the release of these novels I will never know, but I encourage you to not make the same mistake I did and overlook them now.